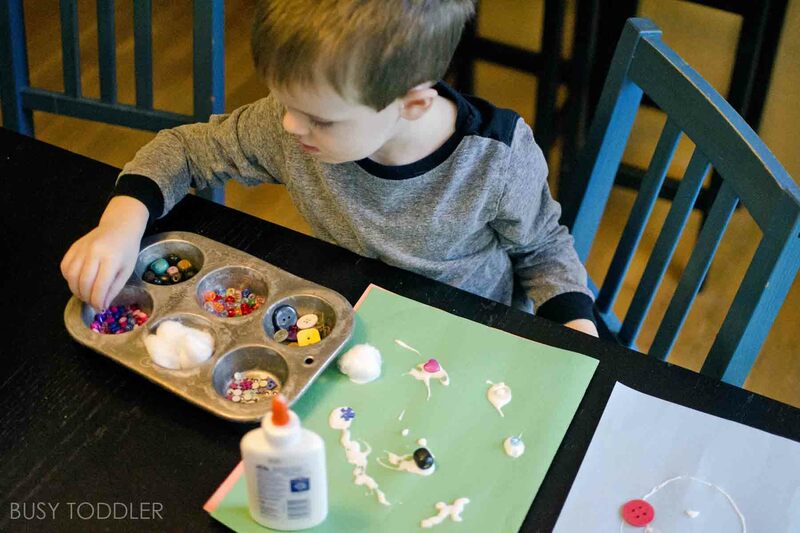 Grab your Elmers for this Glue Playtime activity! Sometimes, I forget how magical everyday items can be to little kids. Post it notes: sticky magicians. Dot stickers: round gold. Glue… glue might just be the most whimsical of all. 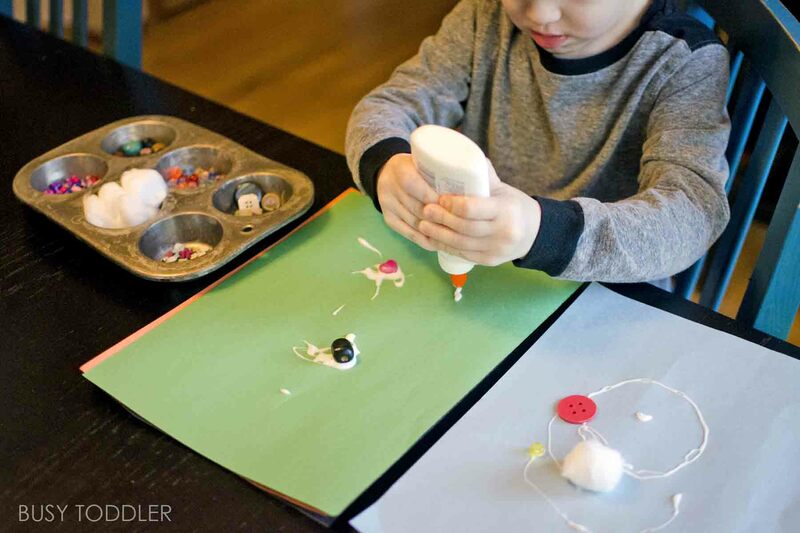 If you haven’t introduced your toddler to glue yet, let today be the day with this glue playtime activity. 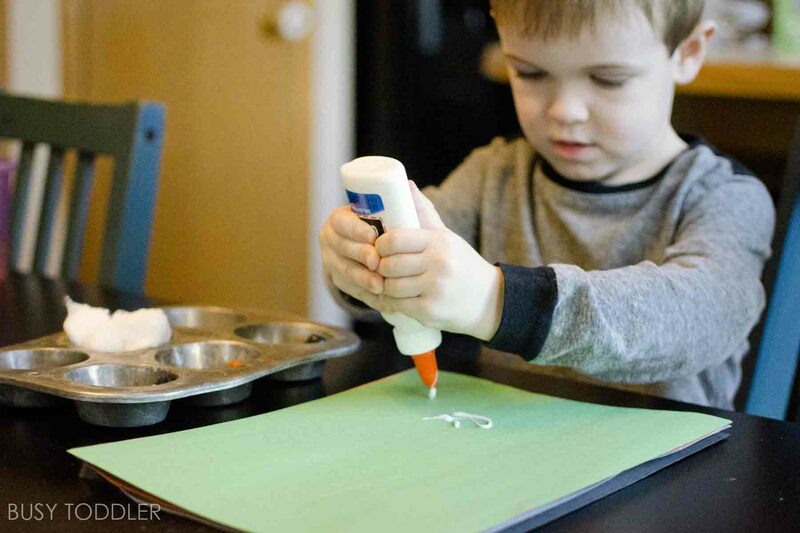 Just a quick FYI, before doing this introduction to wet glue, my son had had extensive practice with a glue stick – I even made him a glue bin activity once so he had some background knowledge coming into this. 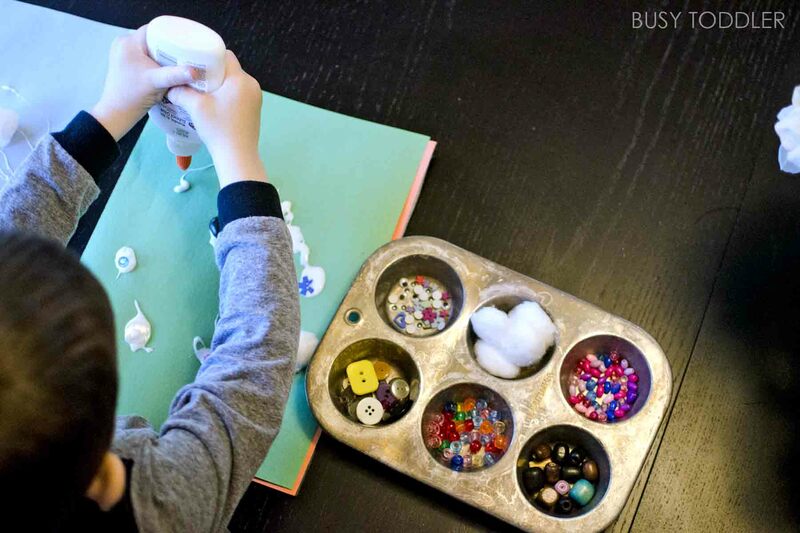 Setting up this glue playtime activity is so easy. The set up for this activity was pretty simple. 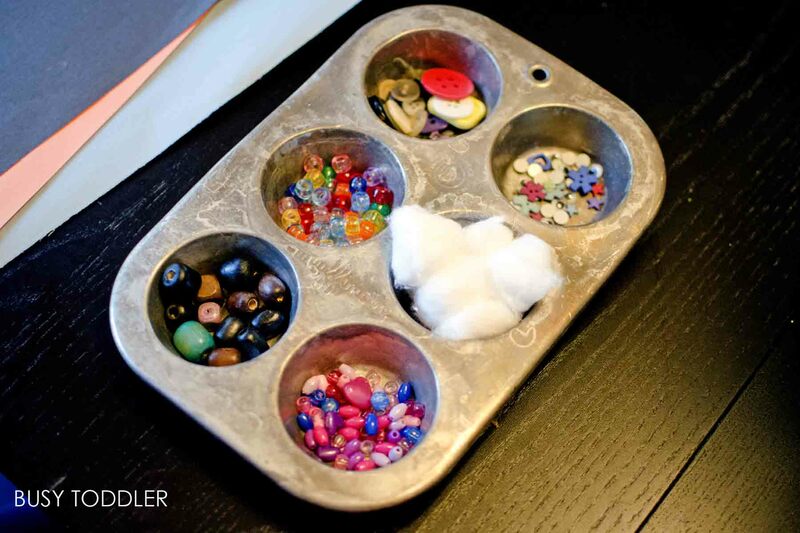 I put a bunch of “glue-able” craft supplies into a muffin tin. I laid out a few pages of construction paper and handed over a bottle of wet glue to my eager toddler (3). 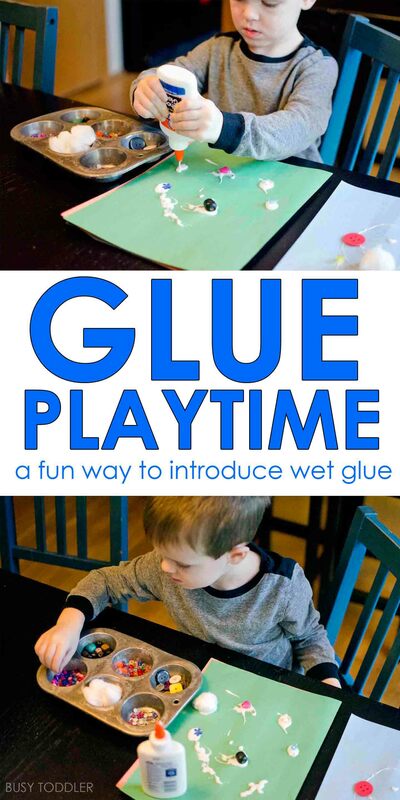 To introduce my toddler to wet glue, we went over a few basic before I sent him off to play/learn. I showed him how to hold the bottle, how to squeeze it, and we noticed how quickly or slowly it can come out. Then I showed him what glue can do: it makes things stick. This was a magical a-ha moment for him. 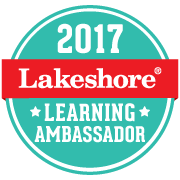 Once I finished our “introduction”, I mostly stood back and let my son have carte blanche to do as he pleased with this activity. There was no “outcome” expected or final product needed. The goal was to learn about wet glue and begin getting a feel for how to use it and work with it. Of course I stayed close by to supervise but I kept myself quiet and in the on-looker role. What are toddlers learning here? 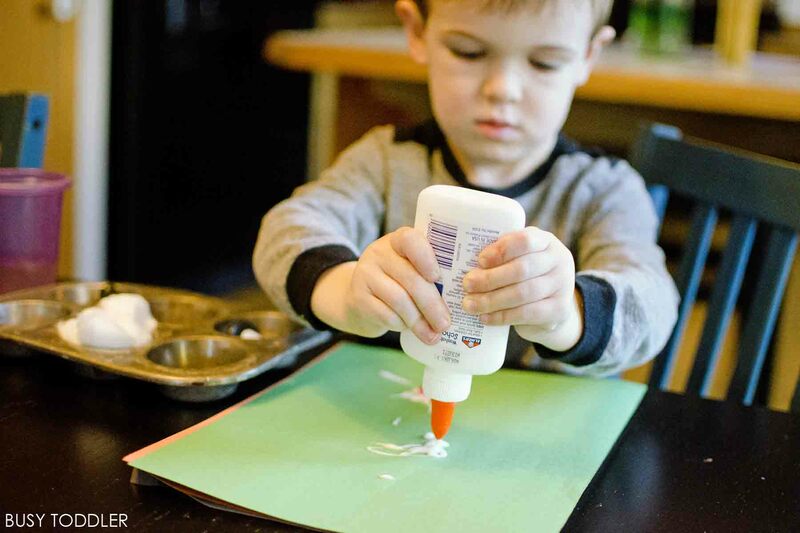 Introducing toddlers to glue is such a fun activity! My son loved learning to glue and making a beautiful piece of art at the same time. 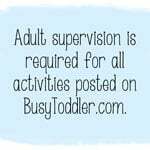 Would your toddler have fun doing this glue playtime activity? 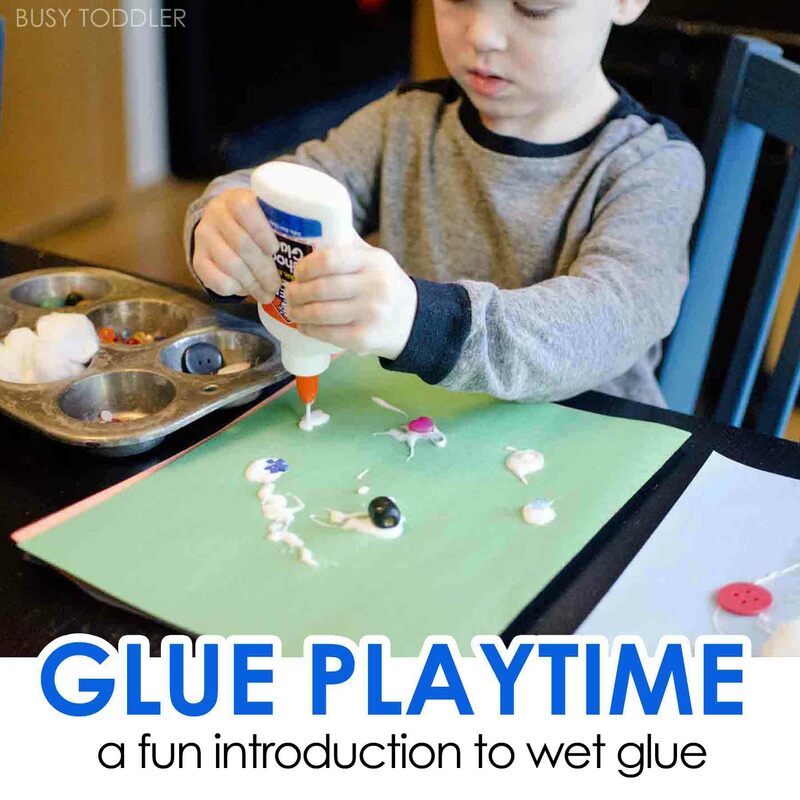 Thanks for posting this as SO MANY parents never let their young children use “REAL GLUE!” I teach preschool and parenting classes and use real glue all the time, I think it is important for many reasons; first fine motor skills as it is difficult to squeeze the bottle AND it comes out white and dries clear (that’s science!) AND many things look better with glue than glue sticks! I always say, “dot, dot, not a lot” when they have the bottle turned over…after a few tries, the kiddos are repeating, “dot, dot, not a lot!” to themselves and the other kiddos!! Just came across your blog and it’s TERRIFIC! I’m so glad you found me, Dana! I taught Kinder and first grade before taking on this Mom gig and it was shocking how few kids had used art supplies. 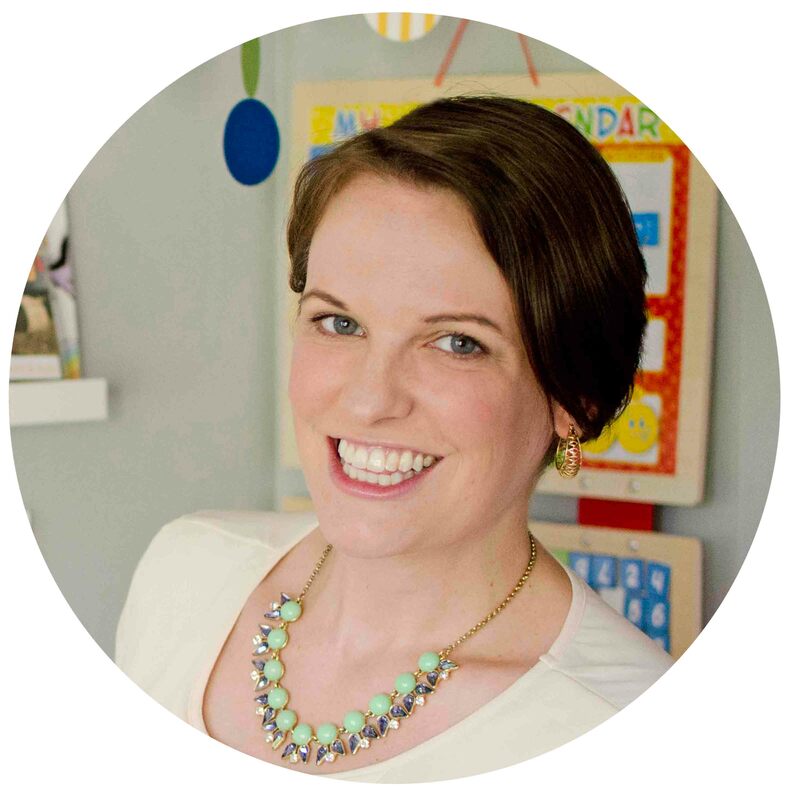 I made it my Mom mission that my kids would know their supplies (and nursery rhymes!) by the time they got to school. XO!